Auto Expo 2018 Theme: ‘Experience Hyundai’ to showcase Newer and ‘Futuristic Innovations’. Under the theme ‘Experience Hyundai´, Hyundai showcased a number of exciting cars and technologies at its pavilion at the Auto Expo 2018, giving visitors a glimpse of the company’s newest and futuristic innovations. 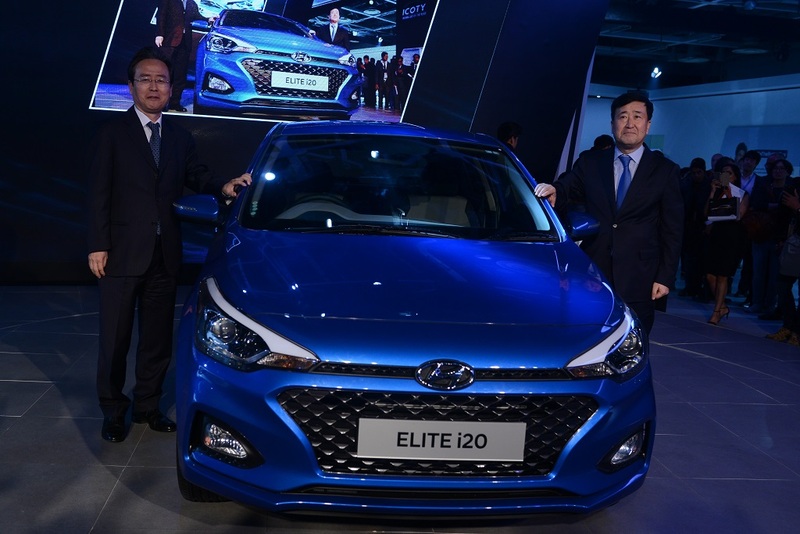 The design of The New 2018 ELITE i20 follows an evolved Premium look, Sporty styling and a robust rear stance based on Hyundai Motor’s advanced design philosophy. The Modern design of The New ELITE i20 flows naturally from front to the rear reflecting beauty in motion inspired from power and elegance of nature. 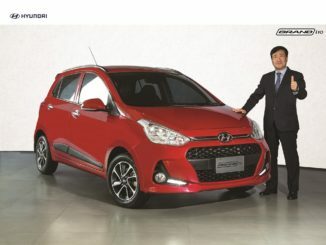 Bold and Premium Styling – The Premium Cascade Design High Gloss Front Grille gives sporty and bold stance to the New 2018 ELITE i20, Projector Headlamps with LED DRL, Positioning and Cornering Lamps, Front Air Curtains, Uniquely Designed Stylish Tail Lamps and R16 Diamond-cut Alloy Wheels together make a blend of intrinsic and intuitive beauty creating accord between a sporty front and bold rear completing the Premium Compact design. The New 2018 ELITE i20 comes with First-in-segment Dual Tone exteriors with Red and Orange interior colour packs to further boost sporty styling of the New 2018 ELITE i20. Hi-Tech & Convenience Features – The New 2018 ELITE i20 features Best in segment 17.77 cm Touchscreen Infotainment System and Audio Video Navigation with IPS (In Plane Switching) Display for wide viewing angle and smart phone connectivity, Apple CarPlay, AndroidAuto & Mirror Link, it also offers DRM Arkamys Sound Mood and Navigation for technology savvy customers. The Human Connected Technology – Hyundai Auto Link – The New 2018 ELITE i20 offers a dynamic new way to stay connected with your car for vehicle health check, Driving information, Road side assistance, Driving History, Eco Driving and Vehicle Health history check with click of button. Uncompromised Safety – New 2018 ELITE i20 takes safety to a whole new level with class-leading features to ensure customers safety. The New 2018 ELITE i20 equipped with 6-Airbags with front dual, side and curtain airbags, Antilock Braking System, Speed Sensing Auto Door Lock, Impact Sensing Auto Door, Unlock and Reverse Parking camera with Dynamic Guidelines for uncompromised safety. Hyundai Motor India acknowledges the government’s vision and plans to make India a Global Leader in electric vehicles by 2030 and is already working on its blueprint to move into new automotive space of eco-friendly vehicles. At Auto Expo 2018, Hyundai is showcasing its commitment to clean mobility solutions and future readiness with unrivalled global technology marvel in Electric Vehicles – Hyundai IONIQ. Commenting on the unveiling of Hyundai’s Global Electric Tech-Marvel, IONIQ at Auto Expo 2018, Mr. Y K KOO, MD & CEO, Hyundai Motor India Ltd said “The IONIQ is a significant leap forward for Hyundai Motor as it intensifies its commitment to produce highly efficient, eco-friendly vehicles. Hyundai is a caring brand and we are committed towards clean mobility solutions to make a long-term transformation that will benefit our future generations. Hyundai is future ready to deliver diverse eco-friendly cars for aspiring customers around the globe without compromising on driving dynamics and performance – a balance of attributes we call ‘Green Performance’ ”. Hyundai Motor Company started the Project IONIQ Lab to explore future mobility solutions through innovation, research and academic projects. It is a part of Hyundai Motor’s Project IONIQ, a long-term research and development project that predict changes in future mobility. Project IONIQ Lab gathers top academics to forecast trends of future mobility. The Hyundai’s Project IONIQ Lab identifies megatrends likely to impact the car industry works to enhance the lives of its customers. It extends Hyundai’s efforts to understand future mobility and influence the concept of ‘Freedom in Mobility’ ‘Whenever and Wherever’. Hyundai Motor is committed to advance theoretical and practical understanding, innovating to develop future mobility solutions tailored to customers’ lifestyles. From a ‘hyper-connected society’ and ‘eco-ism’ to the ‘decentralization of power’ and ‘mega-urbanization’ the megatrends set out the Project IONIQ Lab’s vision of the world, explaining how mobility will interact with each trend. The Auto Expo 2018 has three core pillars at the Hyundai Pavilion 2018 Auto Expo: Design & safety, Future Technology and Digitalization to engage our visitors. There are 8 Experience Zones with exciting and innovative products from international and domestic line up showcasing Hyundai’s Global Technological Strength and Quality Excellence. The 8 exciting zones of the Hyundai booth will treat visitors to fun activities such as simulated driving, FIFA Mind Game giving the customers a unique experience of Brainwave and Levitation Technology, Robotics dance and in the mezzanine area of the booth will welcome visitors to relax and gather. Under Eco-friendly Zone this year, Hyundai has showcased its technological advances for customers to enjoy the latest in green mobility this year with Hyundai IONIQ. IONIQ is World’s first car to offer all 3 electrified versions – Hybrid, Plug-in & All Electric in-line with Government of India’s vision of making India an Electric vehicle Market by 2030. The IONIQ is a significant leap forward for Hyundai Motor as it intensifies its commitment to produce highly efficient, eco-friendly vehicles. IONIQ is recognized with Red Dot Design Award’16 & Good Design Award’16. Highlighting high performance sub-brand N which is a result of intensive testing and product development. The sub-brand N builds on Hyundai Motor’s successful motorsport experiences and technology capability to drive future performance-oriented and race-track-capable models. 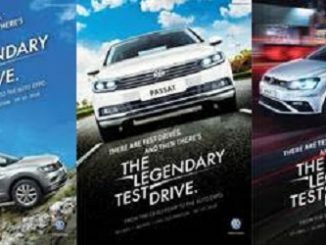 The N capitalizes on Hyundai Motor’s fast-growing strength and signifies the pace of change within the brand, matching the company’s ambition to challenge perceptions by making real and emotional connections with customers. RN 30: The Hyundai N aims for high-performance cars which allow customers to experience the pure pleasure of sports driving. The design of RN30 is based on the new i30, created to offer pure driving pleasure on the race track. It truly embodies the Hyundai N concept of a “high-performance” car that everybody can enjoy with effortlessly. i20 WRC Coupe: The Hyundai i20 Coupe World Rally Championship car is designed and developed to meet brand new World Rally Championship technical requirements. i20 Coupe registered a total of four victories in the last season of World Rally Championship. 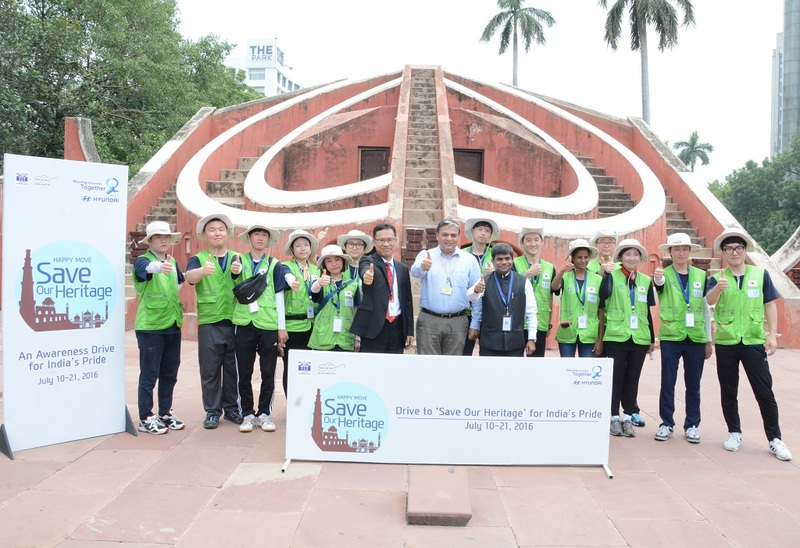 To showcases Hyundai’s innovation and technological advancement in producing World Class Robotics Machinery and engage customers through unique entertainment activities performed by robots like synchronized Robodance on both Hindi and Korean songs symbolizing Indo-Korean Cultural Connect. The Kona is a first global SUV targeting ‘Smart Challengers’ & everyone with ‘Young Passion’, pursuing a lifestyle that transcends generations & age in the ever changing environment. Kona has a voluminous, aggressive body styling, complemented by a low and wide stance with advanced technology and class-leading safety features. The stylish SUV has distinctly positioned Fog lamps & Sharp LED DRLs. Kona has light and rigid body structure and suspension that delivers exceptional ride quality and secure handling. Kona achieved its first milestone in the form of 5 Star rating in EURO NCAP crash test. A special award zone is created to celebrate Hyundai’s milestone achievements for creating industry best Modern Premium Products and winning customers’ love and trust. It showcases Hyundai’s commitment towards its customer through products setting benchmarks in Indian automobile market. Hyundai has always connected with sports enthusiasts by its presence in global sporting activities like BCCI cricket championships, FIFA football championships, golf, and World Rally Championship. The rationale behind these associations is to make fans explore and ‘Experience Hyundai’. At Hyundai Pavilion in Auto Expo 2018, customers’ will be treated to a host of technology aided gaming including football, cricket, simulated driving and NeuroSky FIFA Mind Game. A special dedicated kid’s zone with many interactive fun activities for young Hyundai customers. Hyundai co-produced TV animation ‘Power Battle Watchcar’ to strengthen communication with young generation via well-known characters and ‘Experience Hyundai’. ‘Power Battle Watchcar’ based games will be conducted along with kids merchandise distribution and TV animation screenings. Hyundai has always been an advocate of Safe Driving. Hyundai believes the process of safety begins with the driver taking responsibility for their individual actions. All the CSR activities are conducted towards HMIL’s long term commitment towards road safety under the Safe Move – Road Safety campaign. #BeTheBetterGuy campaign under the Safe Move will encourage visitors to pledge towards responsible road safety behavior and spread the message of road safety and create strong awareness within communities for a positive Behavior Change. The pledge will be posted on the customers’ Social Networking Sites through RFID. An exclusive and dedicated zone created to showcase the range of domestic product line-up to celebrate super performance by segment best and industry benchmark creator products.